A slight variation of these beautifully historically accurate gaslight reproductions are presently hanging in the US Capitol, see Model NS1. 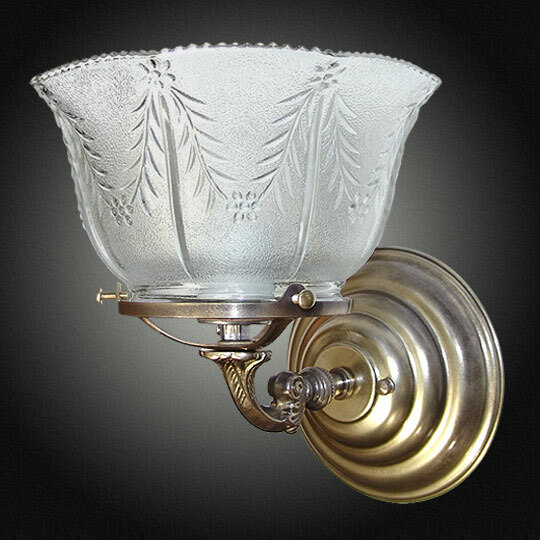 This Colonial gas light is a fine addition to any home where vintage antique styles are present. Shown with Beehive Back Plate and a beautiful 4 inch fitter pressed wheat glass. Shown in Medium Antique Brass. Available in different Metal Finishes, different Glass, Back Plate, multiple arms and many other Custom Options. Width 7 In. / Projection 8 In. / Depth 7 In. Price and Measurements are for fixture configuration as shown and in the metal color shown.